OTTAWA—The Bank of Canada said in a statement on Wednesday that the country’s slumbering economy will require the stimulant of artificially low interest rates for some time to come, although it conceded first-quarter growth was surprisingly perky. 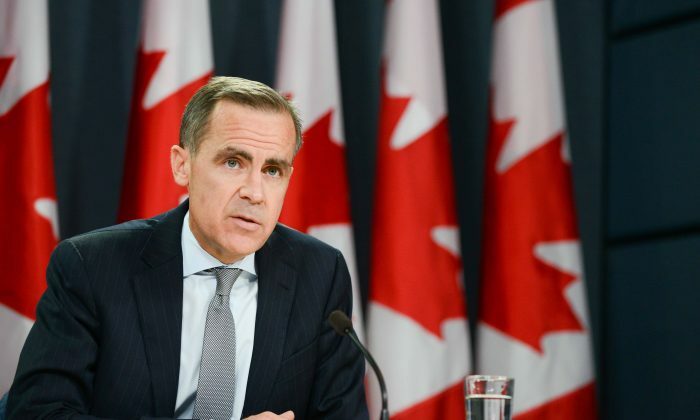 As expected, outgoing governor Mark Carney’s last public move at Canada’s central bank was to stick to the course he has charted since September 2010, keeping the trendsetting policy rate at one percent to induce continued borrowing and spending on the part of consumers and businesses. As well, the bank kept in place its forward looking guidance to markets that the current policy position will likely be needed for some additional time, after which Canadians should look for a modest increase in interest rates. Some analysts had speculated that the outgoing Carney, who departs for the Bank of England as of Saturday, might remove the tightening guidance, but the statement showed no such inclination. Perhaps also expecting a more dovish statement, the immediate market reaction was to boost the Canadian dollar about a quarter of a cent—although the loonie remains near an 11-month low against the U.S. currency. The loonie ended the trading day up 0.4 of a cent at 96.6 cents U.S.
Bank of Montreal economist Doug Porter said he would have supported dropping the hawkish bias, given that the economy remains weak, the housing market has cooled considerably, and inflationary pressures are non-existent. But he said if there was a thought to change course to a neutral stance—which would signal a longer duration of low interest rates—Carney likely wanted to leave the call to his successor Stephen Poloz, who assumes his duties on June 3. In essence, the bank is saying that the Canadian economy continues to require considerable monetary stimulus in order to keep its head above water, given that governments are providing little, the housing market is in decline, commodity prices are weak, and the export sector, while recovering, continues to be hampered by a strong dollar, weak demand, and competition. It predicts Canada’s economy won’t return to full capacity until mid-2015, which some economists suggest may be the point where Canadians should expect to see interest rates normalize. An indication of whether Poloz’s new eyes see the situation differently will have to wait until June 19, when he is due to deliver his first speech, but more likely July 17, when the bank issues an updated opinion on global forces and the Canadian economy. The Carney bank has good company in its current assessment, however. Also on Wednesday, the Organization for Economic Co-operation and Development (OECD) estimated that Canadian growth would average 1.4 percent in 2013, just a shade below the Bank of Canada’s 1.5. The OECD had been more optimistic in November, when it estimated 1.8 percent growth. It too doesn’t expect to see any move to raise interest rates until the latter half of 2014. Porter says he’s not expecting a major policy shift initially under Poloz, who comes to the Bank of Canada from Export Development Canada, which provides financial services that help smooth the way for deals between Canadian companies and their customers abroad. The key adjustment in the bank’s view Wednesday from its previous position is that the first quarter of 2013 was stronger than the 1.5 percent it had anticipated. Most economists think it will be in the 2.0 to 2.5 range, which would be the first plus-two advance since 2011. “In Canada, recent economic indicators suggest that growth in the first quarter was stronger than the bank projected in April,” the bank said, suggesting that it agrees with the private sector consensus. But the bank cautioned that a sprint at the beginning of 2013 doesn’t change the result of the marathon it faces. “For the year as a whole, growth is expected to remain broadly in line with the bank’s [April] forecast of 1.5 percent growth,” it said. The bank has long worried about the long-term impact of keeping interest rates at floor level for an extended period, particularly if they trigger a housing bubble and mountains of household debt that can’t be sustained when rates go up. But it is being helped by circumstances. The real estate market is moderating and household credit growth is slowing, and family debt levels are stabilizing, albeit at record-high levels. As well, inflation is likely to remain subdued for some time. “Reflecting all these factors … the considerable monetary policy stimulus currently in place will likely remain appropriate for a period of time, after which some modest withdrawal will likely be required, consistent with achieving a two percent inflation target,” the bank concluded.